Springs are made to meet the characteristics of each door in terms of its size and weight. Although there are varying types, they're all installed for the same purpose, which is to counterbalance and move the door. When new ones are chosen, knowing the weight of the door or measuring the older ones accurately is of the essence. Average residential doors often have a pair of extension or torsion springs. A double-car door or larger/heavier types might have more. In any case, proper installation and continuous maintenance can help prevent malfunctions and keep safety at a maximum level. Extension and torsion are the two main types. Both are coiled and store tremendous power among their coils in order to lift the heavy door. Their installation, however, has certain differences. The extension type are installed above the tracks at the two sides of the door while the torsion type are mounted above the door's opening. The coils of the extension springs are stressed when the door is shut and the door opens as the coils contract. There is a metal rod called a shaft that runs through torsion springs. They stress across it and unwinds to open the door. What Are Springs Made Of? 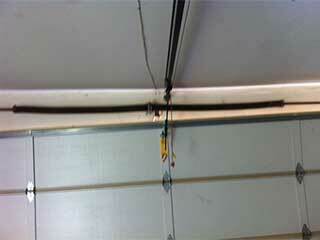 Garage door springs actually consist of several parts, such as brackets, bearings, pulleys and extensions. They might also have safety cables runing through them. Most residential types are made to last for approximately 5 to 7 years and our technicians always check their condition in order to inform you that it's time to replace them before they break. Although broken garage door springs are replaced as soon as possible by our company, ones that snap can cause serious accidents. The garage door repair team of our company is at your service for the times you need an expert's assistance or advice. We provide fast response repairs, which include lubrication, replacement and adjustment. Our technicians can add and release spring tension as well as balance your door. We are trained to service all types of springs, offer same day repairs, are experts in replacement and can answer any question you might care to ask. Call us now or send us a note with your current requests!